The International Space Station just got a whole lot tidier. A pair of NASA astronauts released a capsule loaded with 1.5 tons of trash. 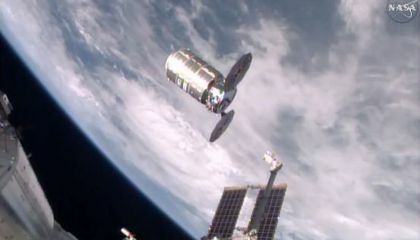 It happened as the space station soared over Bolivia. That country is in South America. The capsule was expected to re-enter the atmosphere and burn up harmlessly over the Pacific on Feb. 20. NASA supplier Orbital ATK launched the capsule to the space station in December. It was full of food, clothes and other goods. The astronauts removed the precious contents. Then they filled it with garbage and old equipment for incineration. Commander Scott Kelly and Timothy Kopra are the Americans on board. They sent computer commands to set the Cygnus free. The stunning 250-mile-high view showed the capsule slowly backing away. Its two circular solar wings looked like open umbrellas. Kelly is close to wrapping up a yearlong mission for NASA. 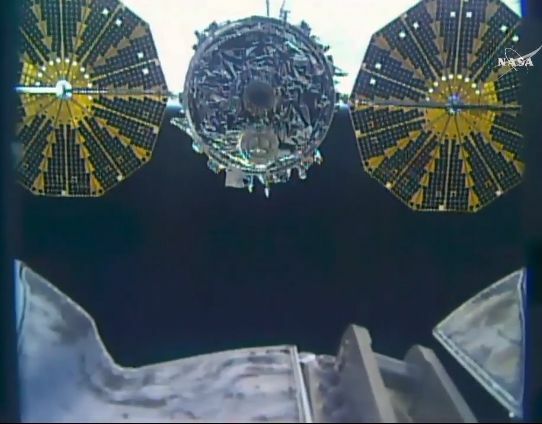 He thanked everyone who worked on the Cygnus. "It's been a pleasure," he noted. "A beautiful release," replied Mission Control. Virginia-based Orbital ATK plans to launch another Cygnus with more supplies from Cape Canaveral, Florida. It is expected to blast off in late March. The flight was delayed a few weeks. That was after black mold contaminated some of the cargo bags. Technicians had to disinfect everything. SpaceX, meanwhile, another commercial cargo carrier for NASA, is aiming to make a delivery in the next few months. The company is working to get back on track following a launch accident last summer. NASA has handed off space station shipments to private business. That allows NASA to focus on getting astronauts beyond low-Earth orbit, namely to Mars. It hopes to do the same with space station crews next year. For now, U.S. astronauts are hitching rides with the Russians. Why doesn't dumping the trash create pollution? Dumping the trash doesn't create pollution because once it re-enters the atmoshere it is expected to burn up. my evidence is,"The capsule was expected to re-enter the atmosphere and burn up harmlessly over the Pacific. "I think this article is really cool. The dumping doesn't create pollution because the capsule burns up when it re enters the atmosphere, burning over the pacific harmlessly. It surprises me that they can do this with a whole 1.5 pounds of trash. This technique can be helping our country/world by not putting as much trash in landfills. This article was cool to learn about the way we are technologically advancing in today's society. Dumping trash create pollution because it makes the planet. Maybe because there not on Earth and space doesn't have gravity or air so it just floats around. It doesn't create pollution because it just float. Because there is no air in space. Dumping the trash doesn't create pollution. "re-enter the atmosphere and burn up harmlessly over the Pacific on Feb. 20." paragraph-2 I found this article interesting because I like space and things that happen in space. I cant believe that they are sending garbage into space. Like isnent it bad for the atmosphere. What if it created a black hole or something.